← Destashification Make-Up Bag, Part 3: The ZIPPER! Another zipper, a few seams and the Make-Up Bag is done! Match centerpoint of zipper to notch in exterior. 1. Find the center point of the longer zipper (lengthwise). Mark it with a pin. 2. Match the zipper centerpoint with the small notch at the top of one of the quilted exteriors. 3. Sew from the centerpoint toward the end of the zipper, approximately 1/4″ from the outer edge of zipper tape. 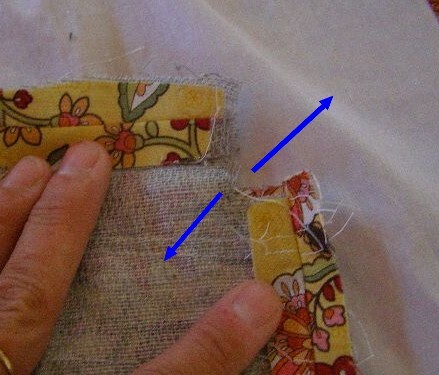 At the end of the zipper, push the zipper tape AWAY and stitch across it as shown in photo. This will hide the raw edges of the zipper tape. 4. Repeat in other direction. Zipper showing first (pink) and second (yellow) seams. 5. 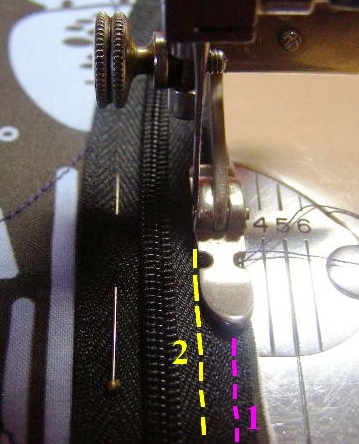 Sew a second zipper seam closer to the zipper teeth, as shown in the photo. 6. Repeat on other side of zipper using the other quilted exterior fabric. 7. Place one of the lining pieces on top of the exterior piece – right sides together – align edges (see Photo Step 7A). 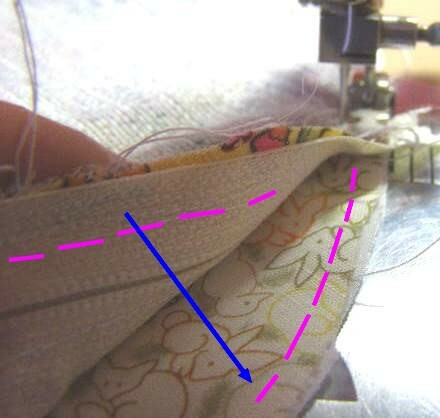 Step 7A: Place lining on top of exterior piece - align edges - sew along pink line. Sew along the second seam line used to sew the zipper to the exterior piece (See Photo Step 7B). 8. Repeat for other side of zipper, using other lining piece. This is a second bag, made in my current favorite color scheme – yellow, pink and red (with a bit of brown to keep it from being too loud). You never know what The Stash holds! 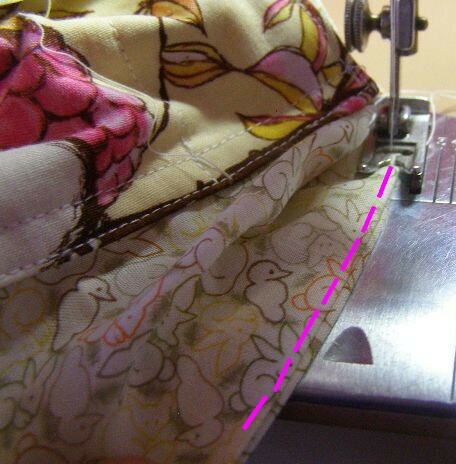 A Zipper – in a lined and curved seam – can now be listed the sewing repertoire! …And Zipper-phobia has been replaced by Zipper-ease-a-mania! Pull the bag flat so that it looks like the picture in the Step 9 Photo. Perhaps this shape could best be described as two lima beans stuck together? Sew along the seam lines shown in pink in the Step 9 photo. 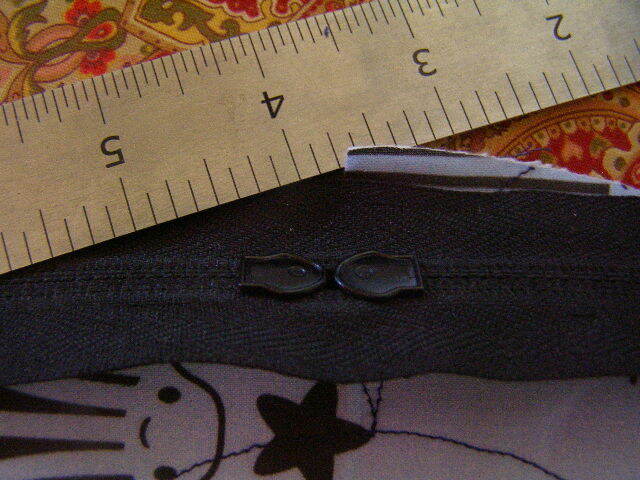 Stop the side seams about 1/2″ -1/4″ from the zipper. The scissors in the Step 9B photo are pointing to the end of the zipper seam. Do not try to sew all the way to that point. 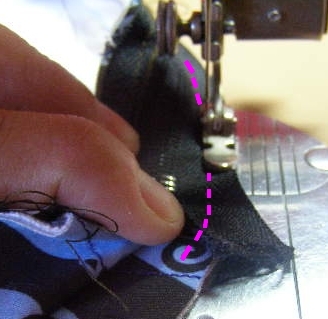 The pink circle in the photo is within 1/2″ -1/4″ of the end of the zipper seam. End the side seam at that point. 10. Reach through opening in the lining bottom seam and turn bag right side out. Marvel at it for a few minutes, then turn it inside out again. Step 11. Lay flat and then pull sides apart. 11. Iron bottom and side seams open (to the extent possible). Lay the exterior piece flat as shown in Photo Step 11. Put your index fingers into the square opening and gently pull the sides apart in the direction of the blue arrows. This forms the gusset (flat bottom) so the bag does not fall over. 12. 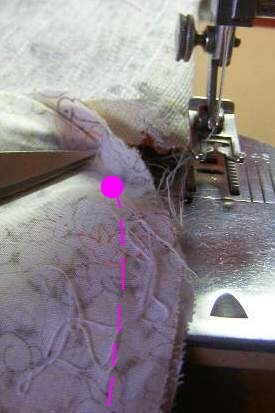 Line up the side seam with the bottom seam as shown in Photo Step 12. 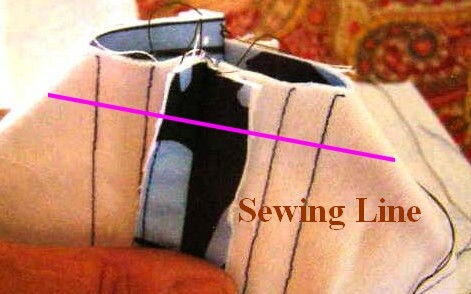 Sew along the Sewing Line as pictured by the pink line in Photo Step 12. 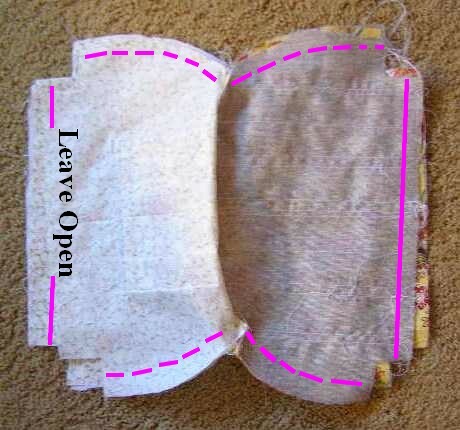 Repeat this for other side of bag exterior and both side of the lining. Step 13: Align gusset seams of lining and exterior. 13. 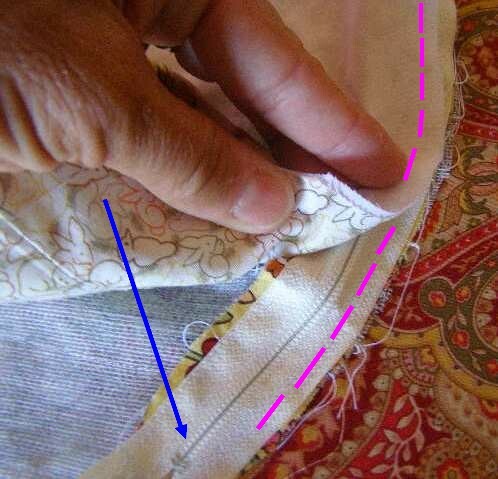 Align the lining gusset seams with the exterior gusset seam on one end of the bag as shown in Photo Step 13. Sew the two gussets together along the same seam line used to sew the lining gusset seam. 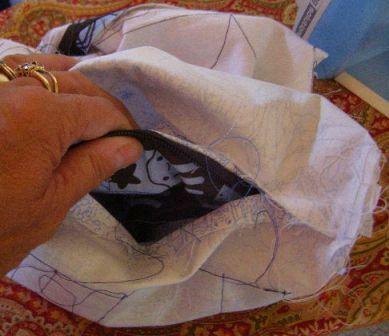 By sewing the two gussets together, the lining will not come loose in the bottom of the bag. Turn bag right side out again. 14. 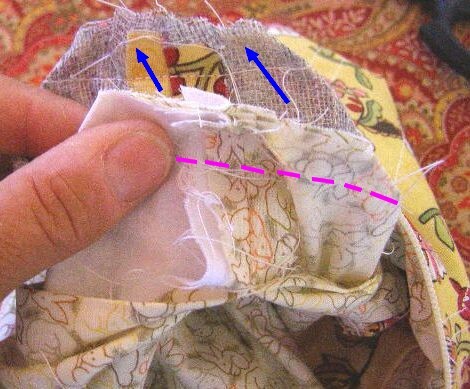 Two options exist for sewing the opening in the bottom seam of the lining: Machine stitching or hand stitching. I tend to do it by hand, because it is invisible. However, it can be accomplished quite quickly by machine as shown in the Step 14 Photo. Either way, when that opening is closed…the Cosmetics Case/Make-Up Bag is complete! 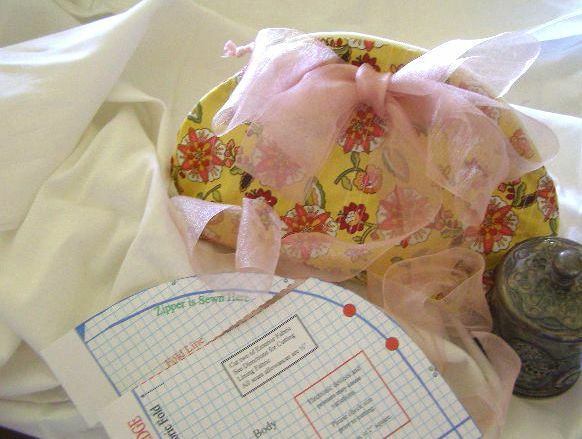 This entry was posted in Accessories, Purses, Sewing, Sewing for a Teenager, Tutorial and tagged Cosmetics Case, how-to, lining, Purse, Zipper. Bookmark the permalink. Thank you so much. I have always wanted to make a make-up bag. I think I will make some for my daughters also. Thanks so much. Check out my blog. I want to meet people online through sewing, because I love to sew too.